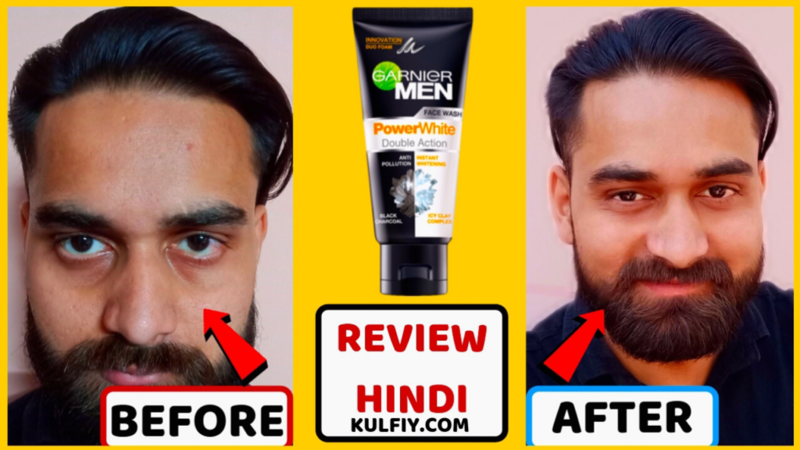 In this video, I have reviewed Garnier Men Power White Double Action Face Wash in Hindi. Also, I have used this Garnier Face Wash for Men, which is Best face wash for men, face wash for oily skin, Face wash for Dry skin. Garnier Men Power white double action face wash a dual texture face wash made to remove dust and pollution from your face and to give you a fairer skin. The Garnier Men power white enriched with salicylic active and vitamin C reduces dullness of skin. This Garnier Power white double action 2 in 1 cleanses your skin deeply, this face wash also removes oil, dirt, and pollution to keep your skin fit. This will make your skin looks even more radiant and let you feel fresh all day after using Garnier Men Power white double action face wash.
How to use Garnier Men Power white double action face wash? Or How to apply this face wash on your face? *Apply power white face wash on wet face 2 times a day for better results. *Gently Massage in with fingertips & Make sure to avoid EYE CONTOUR area. *Rinse off and use daily as I mentioned above. If possible use twice a day for better results. 1. How to use Garnier Men Power white double action face wash? 2. Is Garnier Men Power white good for acne? Yes, it works more effectively in clearing off acne. 3. Is Garnier Men double action face wash is better than Garnier Acno Fight? Yes, It is better in brightness on the face, If you want coolness. 4. Will I get White Skin after using Garnier men face wash? Yes, you will get white skin keep using regular or twice a day. 5. What are the benefits of Garnier Men Power white Face Wash? Cleanses your skin deeply, also removes oil, dirt, and pollution to keep your skin fit every day. — Garnier Men power white face wash is very beneficial for those persons who work in polluted areas. Vitamin C which removes dullness from the face, that’s why I use it. — I am exposed to sun and sweat and dust all day long. I come home and cleanse my face using Garnier men face wash as a first thing. And I am astonished to see that it just pulls off all the dust, pollutants and dirt from your face and neck. The face feels much more lively and fair and fresh after usage. Recommended for regular immediate use after exposure to dusty areas, although not for a daily bathing purpose.